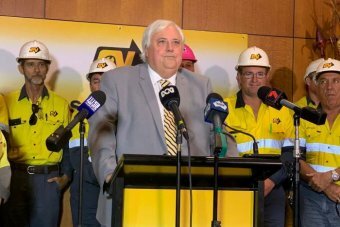 Businessman and political hopeful, Clive Palmer, has announced plans to pay back “millions of dollars” that was owed to hundreds of workers who lost their jobs when his Queensland nickel refinery went bust more than three years ago. Fronting the press in Townsville this morning, Mr Palmer said he wanted to reopen the refinery immediately. When the company collapsed in 2016, it was left owing debts of about $300 million to creditors, including local businesses and the Federal Government which covered entitlements for the 800 people who lost their jobs. Last month, ABC’s 730 revealed workplace safety concerns at the Townsville refinery.